Holy cats. Did you realize that tonight is Daylight Savings? It’s too soon! Hope we wake up on time tomorrow. We had uke night tonight, and boy do we have a nice place to meet! It’s at a bookstore/bistro/business center, and it’s pretty swanky! I took some photos, but of course they are blurry. 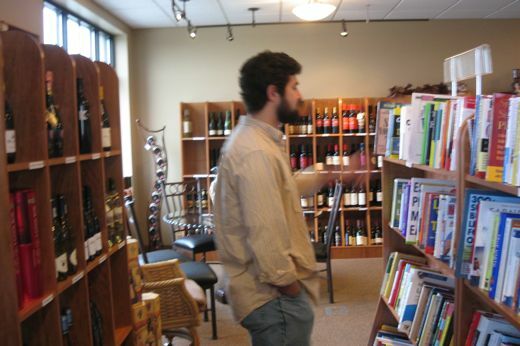 Here’s Lloyd looking at some books, and yes – that’s wine behind him. We had some beer with dinner at the bistro, and then we played. Beer makes us sound awesome! Booze and books AND ukuleles? That’s a brawl waiting to happen. We don’t let the Irish come anymore. Nice! Did you make it up this morning? I did, but I feel like I got run over by a truck. Coffee……. If we would have relied on my cell phone to be our alarm clock (like last year), we would have woken up late. It’s 8:17, but my cell says it’s 7:17. Stupid… whoever’s my cell provider…. That’s my favorite shirt of Lloyd’s. You look good in that one Lloyd. I was just saying last night that we needed to get you a babysitter and take you along. You’d like this store! Did you buy a bottle of wine for Beth? She’d like for Tim to sleep better. OR perhaps the uke group could come serenade Tim for a night? Tara could have a solo. They actually want to come to Seward and play sometime. Lauren, of course, would rather go to Omaha, because then she gets to go to Omaha. They should come. And we could play at the Gallery. That place looks awesome! I wish we had such a place here in MD, dnag it. All we can get with a good book here is a cup of coffee. I’m convincing our book club to come to lunch there … see ‘ya soon!